We are on Facebook so if you would like more information - and probably more up to date information - on what we are doing then please join our Facebook site and you will know everything..... well as far as what we are doing and organising anyway. MRA Townsville and Districts have a couple of main events each year. The 'Stinger Rally' is the first which is held around mid May and is great weekend at Mt Fox Lions Club camping ground, Mt Fox. 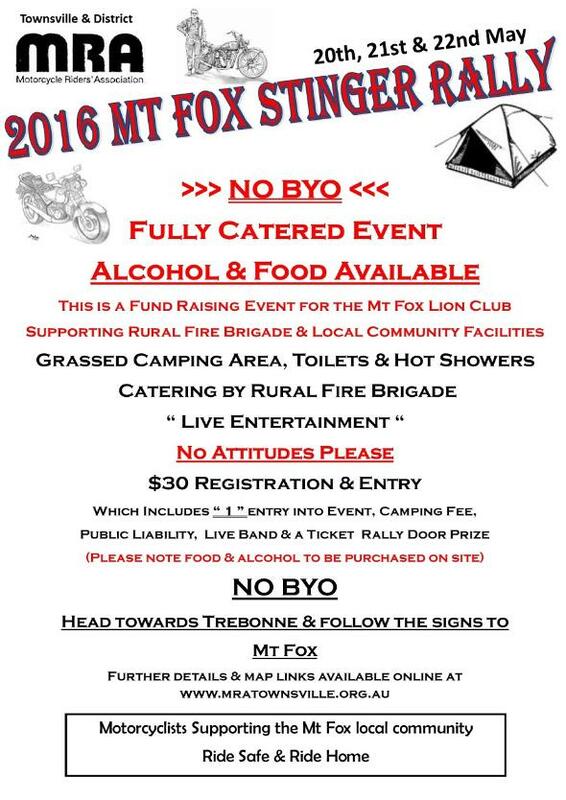 There is plenty of room for camping and the food and drink is catered for by the Mt Fox Lions Club and the Rural Fire Brigade. The last event was a great success again and many thanks to all who came along and supported the fund raiser. When we get a hold of the pictures from the couple of days there we will post them on this new web site. The second but certainly not the least is the end of year Christmas 'Toy Run'. More information on this will be posted on the sub links on the Events tab ASAP. We hold many other events throughout the year including poker runs, over-night camping trips and social rides. Keep in touch through Facebook and this site and you will always know what we are up to. Ride safe and hope to see you all soon.